Last year, Union Pacific Railroad set a record in all five of its train-length categories. At any given time on Class Is’ networks, trains stretching from 10,000 to 15,000 feet long are snaking their way to a destination. Pulling well more than 100 cars, the trains are much longer than — and in some cases more than double the size of — a typical 5,000- to 6,000-foot train. Canadian Pacific, CN and Union Pacific Railroad have incorporated long trains into their operating strategies and continue to aggressively push the length envelope. But BNSF Railway Co., CSX, Kansas City Southern and Norfolk Southern Railway only operate them on a case-by-case or limited basis, such as to transport grain or containers in greater volumes. Canadian Pacific is acquiring grain hoppers in part for a new 8,500-foot model for dedicated unit trains. Grain unit trains currently are 7,000 feet long. When it comes to the reasons for lengthening trains, all the Class Is are in unison: to boost productivity, gain more efficiencies and cut costs. Transporting more freight on one train helps to maximize locomotives, crews, fuel and other resources, and trim labor and diesel expenses. It also enables the railroads to reduce the number of trains on their networks, creating more space on certain route segments for additional traffic. Although there aren’t many long trains navigating freight railroads’ systems these days — 95 percent are shorter than 10,000 feet, according to the Association of American Railroads — Class Is have been lengthening trains for quite a while. Given that shippers’ demands and the supply chain continue to evolve — and that Class Is continually seek better operating performance — long trains likely are here to stay. So much so, some Class Is are constructing 10,000-foot sidings, extending sidings or building more double track to accommodate them. UP is adding more sidings to support ongoing efforts to lengthen trains. A number of technologies — including positive train control — enable the Class I to push train length, UP officials say. In addition, the railroad uses analytics to help determine and increase train lengths. UP also is advancing a “Blend and Balance” initiative that in part involves long trains. The initiative calls for blending service networks — such as automotive and manifest trains — and better balancing resources to boost productivity, reduce idle time and improve asset utilization. Last year, the Class I set a record in all five train-length categories. Intermodal trains averaged 173 boxes, up from 170 in 2016 and 172 in 2015; coal trains averaged 131 cars, up from 130 in 2016 and 2015; grain trains averaged 102 cars, up from 101 in 2016 and 99 in 2015; manifest trains averaged 102 cars, up from 98 in 2016 and 94 in 2015; and automotive trains averaged 71 cars, up from 68 in 2016 and 67 in 2015. 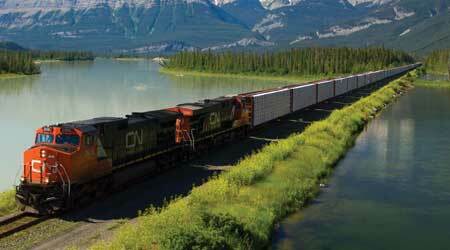 In 2017, CN’s mainline trains averaged about 9,000 feet in length and 95,000 tons in weight. CN also is making strides in lengthening trains. The Class I doesn’t stress footage data for long trains; instead, it focuses on train productivity, or gross ton miles (GTMs) per train mile. CN data shows train productivity increased 3 percent last year from 9,314 GTMs per train mile in 2016 to 9,424 GTMs per train mile in 2017. Prior-year figures were 8,739 in 2015, 8,625 in 2014 and 8,438 in 2013. Since 2000, train productivity has increased nearly 70 percent as CN continues to operate longer trains carrying more tonnage. Last year, the Class I’s average mainline train length was about 9,000 feet and average trainload weighed about 95,000 tons. CN continues to build 10,000- to 12,000-foot sidings and construct more double track to support long trains. Since 2000, the Class I has taken on 188 long siding and double-track projects. 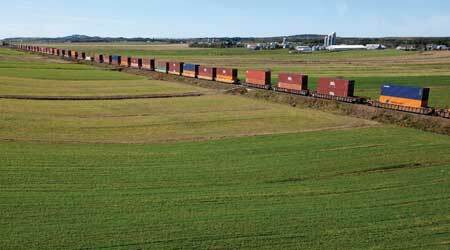 • Saskatchewan — 10 miles of new double track east of Melville and 7 miles of double track west of the Saskatchewan-Manitoba border. CP also is building and extending sidings to accommodate long trains. This year, the Class I plans to build three new sidings and extend six others across its network. CP’s average train length dipped slightly last year from 7,217 feet in 2016 to 7,214 feet. But over the five-year period from 2013 to 2017, train length increased 10 percent from 6,530 feet to 7,214 feet. The Class I’s average train weight last year rose from 8,614 tons in 2016 to 8,806 tons. 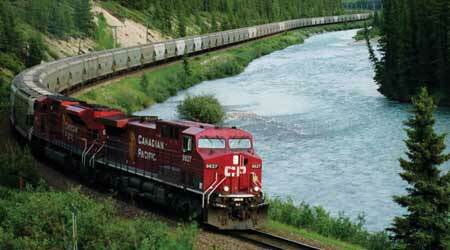 CP is making other investments that involve long trains, too. On June 7, the Class I announced plans to spend more than a half-billion Canadian dollars on new high-capacity hopper cars that will help the railroad work toward an 8,500-foot unit train model for dedicated grain trains. CP placed an initial order for 1,000 grain hoppers with National Steel Car Ltd.; more than 500 of them are expected to enter service by year’s end. Over the next four years, the Class I plans to order about 5,900 hoppers in total. For now, the shorter and lighter hoppers will enable CP to boost capacity per grain train about 16 percent by placing 118 instead of 112 cars on the current 7,000-foot unit trains. The 8,500-foot trains will include a minimum of 134 hoppers — or 20 percent more cars than the current trains — and eventually will sport 147 cars. The railroad is working with grain elevators and ports to build or expand infrastructure to accommodate the loading and unloading of 8,500-foot trains clear of any mainline. CSX also aims to lengthen some trains to boost throughput and improve asset utilization, but not to the extent of CP, CN or UP. As part of its implementation of scheduled railroading, CSX recently increased train lengths by consolidating train profiles to achieve efficiencies, said spokesman Smith in his email. 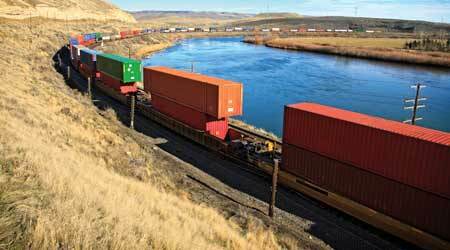 All Class Is are lengthening intermodal trains to a degree to gain efficiencies. In first-quarter 2018, the Class I’s average train length was about 6,890 feet for all road trains in the network, about 5 percent longer than the average train length in first-quarter 2017. “Increased train length contributed to a significant reduction in the number of trains operated on a daily basis. Year over year, [we] reduced the total number of active road trains per day by approximately 26 percent, or about 222 trains per day,” said Smith. Operating longer and fewer trains both enhances safety and generates several benefits, such as fewer train starts and enhanced productivity, he said. Longer trains — which often utilize mid-train distributed power — also are easier for engineers to operate and the Class I has logged far fewer train-handling exceptions on such trains, said Smith. The public can benefit from long trains, too. By reducing the number of trains CSX operates, there are fewer opportunities for trains and vehicles to meet at grade crossings, said Smith. 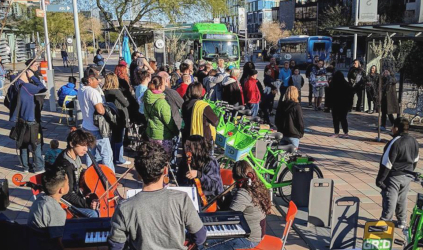 “Consequently, [we’ve] experienced fewer crossing incidents per year as train length increases and train count decreases,” he said. KCS also has cut the number of trains operating in its network — but only slightly — by running some longer grain and intermodal trains. The railroad searches for opportunities to operate long trains if they don’t burden customers, said KCS Executive Vice President and Chief Operating Officer Jeff Songer during a late May interview. An example: if such a train reduced transit time by a day and didn’t require a sacrifice from a customer, he said. The overall length of KCS’ grain trains has increased 7 percent as the Class I aims to boost the number of cars from 80 to 100. KCS has jointly invested with a shipper in Mexico to handle 100-car grain trains at both origin and destination, he said. The Class I’s intermodal trains now average 5,200 feet, but KCS aims to lengthen trains in some lanes, said Songer. Along the Meridian Speedway between Meridian, Mississippi, and Shreveport, Louisiana, intermodal trains reach 10,000 feet. Three sidings along the 320-mile speedway have been extended from 6,000 to 10,000 feet to support those trains. Now, any new or extended siding on KCS’ network must stretch to 10,000 feet, said Songer. The railroad currently is analyzing train starts and other data to determine if manifest trains could be lengthened without impacting customers, he said. Meanwhile, BNSF is testing long trains on a limited basis. The tests primarily involve 12,000- to 16,000-foot intermodal trains moving from ports in Los Angeles and Long Beach, California, to Chicago. 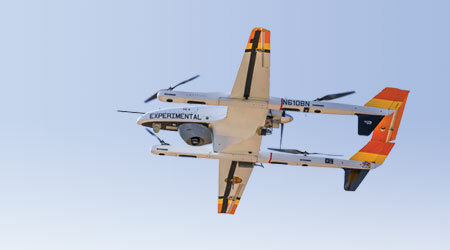 “Our test runs are exploring what types of productivity and efficiency gains can be achieved, as well as giving us more insights into the logistical challenges and implications of running longer trains,” said BNSF spokeswoman Amy Casas in an email. For now, long trains aren’t part of the railroad’s operating strategy, she added. “We are more focused on making sure our trains are the right size to meet our customers’ needs,” said Casas. Overall, the Class I’s average train length is holding steady at about 8,000 feet, but it can vary depending on the commodity, she said. However, any train that’s lengthened to 10,000 feet or more poses safety concerns, SMART Transportation Division (TD) officials believe. A 2-mile-plus-long train can interrupt crew radio communications, block grade crossings for long periods — hindering emergency vehicles — and increase the probability of a mechanical failure, said SMART TD National Legislative Director John Risch during a June 5 interview. “In mountain territory, a conductor can walk quite a ways from the locomotive, making communication with the cab difficult. That puts workers in dangerous situations,” said Risch, who was a locomotive engineer for more than 30 years. Another potential danger: additional in-train forces, which make it hard to keep a long train intact, he said. “When you double a train from 100 cars to 200 cars and then the train breaks up, the efficiencies the railroads talk about go out the window,” said Risch. The union last year asked the Federal Railroad Administration (FRA) to issue an emergency order limiting train length. But in March 2018, FRA officials sent a letter to SMART TD leaders stating there isn’t sufficient data or evidence to justify such an order. In a similar vein, House Transportation and Infrastructure Committee members late last year sent a letter requesting that the Government Accountability Office (GAO) conduct a study on long trains’ effects and potential safety hazards. The members cited concerns about an August 2017 derailment in Hyndman, Pennsylvania, that involved a 178-car CSX train. GAO officials are working on the study, which is expected to be released early next year. “I think there [then] will be some background for Congress to use if it chooses to delve into the issue,” said Risch. The main problem for long-train opponents is a lack of data supporting their arguments, especially since the FRA and Surface Transportation Board don’t compile such information, he said. For example, there’s no evidence to back the SMART TD’s claim that railroad workers aren’t sufficiently trained to handle long trains. KCS’ Songer believes there’s no merit to the union’s argument. “Railroads are doing all they can to improve safety,” he said. UP officials concur, especially in terms of ensuring workers can safely handle long trains. The Class I’s crews receive detailed information about the train they operate, including length and weight, and obtain ongoing training to ensure they’re prepared for unique train-handling situations, according to a UP spokesperson. Moreover, the railroad on a daily basis typically operates 14,000- to 15,000-foot trains in a significant portion of its double-track network without incident, said EVP and COO Cameron Scott on May 31 during UP’s investor day in Omaha, Nebraska. “So, from a safety perspective, there isn’t an issue there,” he said.